LANGLEY — Welcome back to Varsity Letter’s B.C. senior boys rugby report. VANCOUVER — Point Grey’s regular field was unavailable, thus the scene shifted to sloping, wind-swept field at nearby Prince of Wales Secondary. It was truly a tale of two halves, with all of the scoring taking place at the north end of the field. En route to victory, the Double A No. 5-ranked Tigers came flying out of the gates, scoring five first-half tries, including the first which came just seconds into the match. 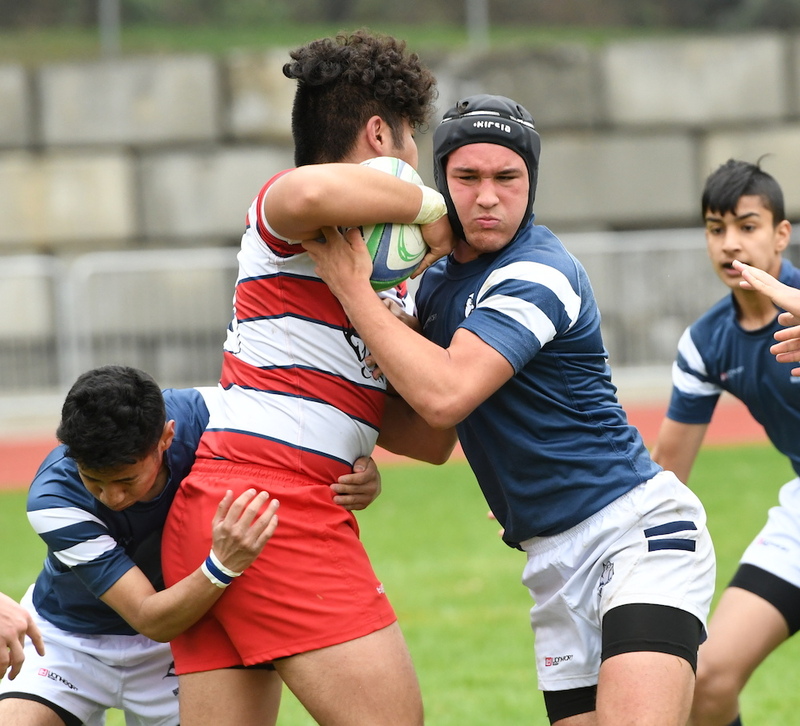 Justin Tuazon, George Miller, Wilson Huynh, Ahmad Suliman, and Henry Bibby accounted for those five tries with Kiya Vivier-Miller adding three converts. In the second half, the Greyhounds came out hungry and scored three unanswered tries to make the 31-21 final complete. LANGLEY — A tremendous Triple A battle between a pair of Top 10 teams swung in the late favour of the defending B.C. champions on Thursday. In a physical battle on a wet and mucky pitch at Langley Rugby Club, the No. 1-ranked South Delta Sun Devils came away with a one-score win over the host and No. 8-ranked R.E. Mountain Eagles. “Both sides put in courageous efforts today,” said Sun Devils head coach Spencer Baines of a match which his team led 24-23 late before closing out with a much-needed converted try. Mountain at one point of the second half, held at their goal line for an extended stretch of minutes, continually absorbing the relentless pick-and-go’s from South Delta. 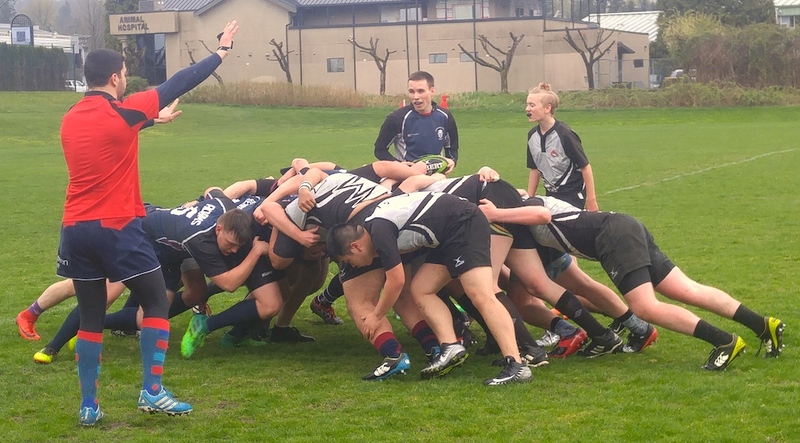 After many minutes of work and phases, eventually South Delta punched it in for a try. The first try of the game came from South Delta’s No. 10 Evan Paterson who showcased his running ability by finding a hole in the line and touching the ball down in the tryzone. The Eagles, responding well to the pressure, capitalizing on the numerous South Delta infractions by slotting three penalty kicks over the course of the game. Mountain also took advantage of the plentiful penalties by kicking deep for touch and reliably winning their line-outs with their effective and enormous front jumper. Late in the first half, South Delta strung together some nice phases, having their forwards attacking both sides of the field and looking for openings in the always solid Mountain defensive line. Through persistence and possession, South Delta managed to find a few tries by finally managing to keep possession and finding some gaps to attack. NORTH VANCOUVER — The Triple A No. 5-ranked Handsworth Royals pushed their record to 4-0 following a convincing win over the rival, No. 7 West Vancouver Highlanders. Darren Colpitts had a dominant game on defence and offence, the latter highlighted by a tackle-shedding 40-metre run to touch. Steele Young took a nice off-load from teammate Robert Lutman for a 60-metre score, while Lutman, off a well-run pick-and-go, also found the end zone. Dom Foulness, from close quarters, added two more tries for the Royals who were playing their home opener. Handsworth had a lengthy defensive stand late in the second half before West Vancouver punched in a try. 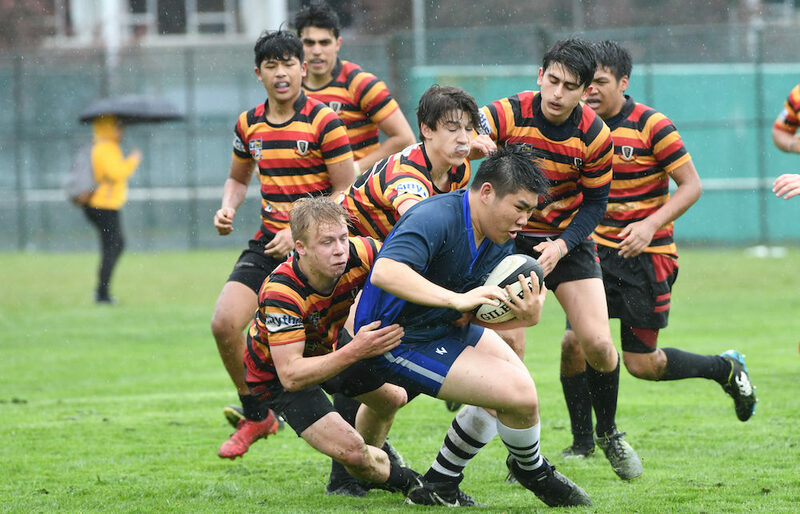 COQUITLAM — Scrum half Feargal Kearney scored a pair of first-half tries, carrying the Blue Devils to a decisive win over the crosstown rival Talons. In a game played under light rain, Best’s Ethan Adams opened the score with a try. Shortly after, the Blue Devils were able to capitalize again on a free kick call with a quick tap-and-go by Kearney. Gleneagle nearly scored in the corner, however the referee and the touch judge declared that the player had stepped out of bounds before he was able to ground the ball. Charles Best managed to work themselves back down the field and were rewarded with another try by the Kearney for a 17-0 halftime lead. Over the second half, Gleneagle were much more organized in their attack. In the 40th minute, the referee penalized Best with a yellow card for a high tackle and Gleneagle were able to capitalize on the overlap and earn their first try of the game. Charles Best managed to capitalize one more time when stand-off Garrett Patey broke the line. Razley Dang and Tony Miao played excellent games on both offense and defense in the loss for the Talons. BURNABY — Centre Johdai Kobayashi, prop Kris Kemp and Double-A No. 8 Matt Lindsay, the latter the Man of the Match for his play in both attack and defence, helped carry West Vancouver’s Double-A No. 4 Rockridge Ravens past the first-year Bulldogs in a match played at Burnaby Lakes. “Tough weather conditions, and that along with a very determined Byrne Creek side made us earn everything that we got today,” said Ravens’ head coach Perino Zambon. Francesco Tosato continued to lead for the Bulldogs, scoring Byrne Creek’s lone try on the day. Ashty Omar added the convert. Strong performances also put in by basketball crossovers Macdonald Chamboko and Chidabaeum Nkologku. LANGLEY — It was a crosstown derby that had a little bit of everything. Most of all, however, it was about epic rally. First from 12-0, then 17-3 and finally 24-8, the latter deficit a second-half hole which looked much too large for the Double-A No. 6-ranked D.W. Poppy Redhawks to ever climb out of against the rival Langley Saints. Two tries later, however, Poppy had climbed to within 24-20. The Redhawks were then able to steal the scrum and two phases later as part of the game’s final play, prop Kasper Henderson’s third-try of the game was its walk-off winner. Also scoring for Poppy was 8-man Brian Carlson, while flyhalf Henry Brown kicked a penalty and a convert. 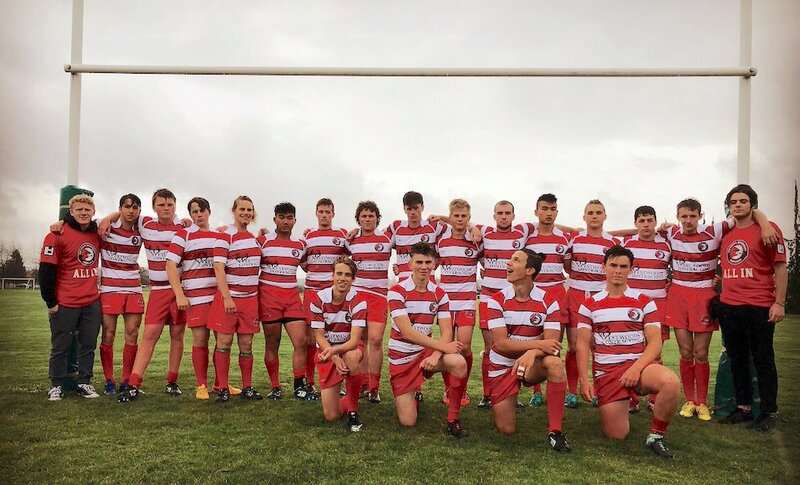 RICHMOND — The host Wildcats started with real intensity, scoring two tremendous converted tries over the first eight minutes, setting the tone for a display of great team play and snapping its disappointing two-game losing streak to begin the season. McMath used the ball beautifully, spreading it wide and combining that with some great kicking plays to cross the try line seven times. No. 8 Ben Spare and flanker Jake Spare also scored tries in the balanced team effort.